I decided to be crafty for Christmas this year. I am lucky enough to have both of my Grandmas nearby and so for Christmas this year, I decided to do these yarn wreaths for them. I figured since they're not holiday-themed, they can keep them up anytime of the year (if they want... they might think they're really ugly and just hang them up so I don't feel bad, but Grandmas are great at making you think all your creations are beautiful, whether they are or not) I not-so-sneakily asked them what their favorite colors were, and they were, respectively: pink and purple. I have to give credit for this idea to my mom, who when I asked for suggestions of what to get as gifts this year, she said, "why don't you make them each a wreath?" Great idea! So, I hopped on Pinterest and subsequently pinned about 100 different ideas. I really liked the yarn wreaths because you can make them in any color of the rainbow, so the possibilities are endless. 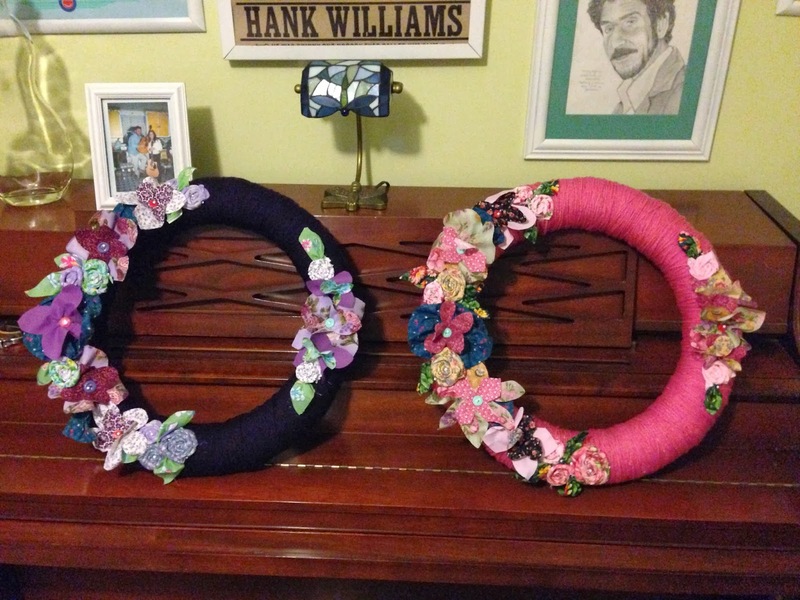 Pinterest also has a ton of ideas for fabric flowers, which I thought would make a nice addition to these wreaths. 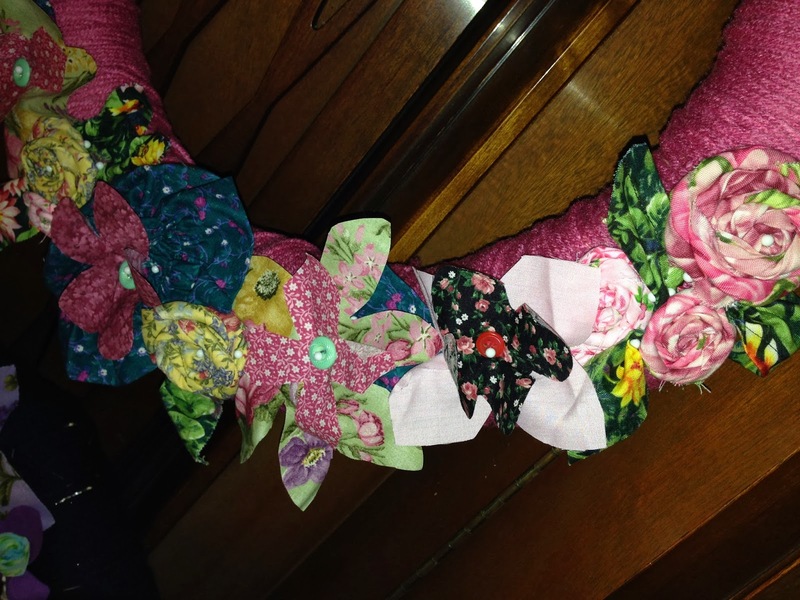 I sort of adapted this idea to my needs using scraps of fabric that I got from.... yep, you guessed it! My Grandma! 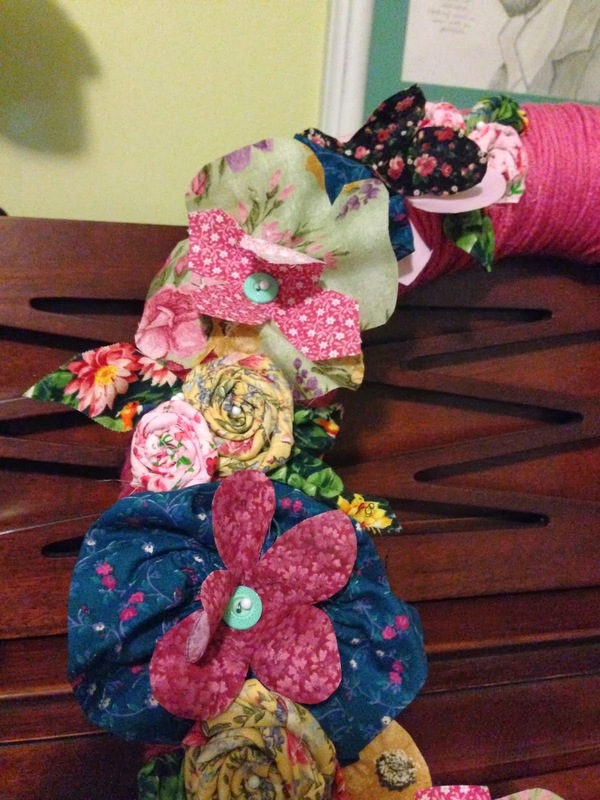 She has an entire dresser full of scrap fabric from past crafts and sewing projects so I "borrowed" all of it... for "Christmas crafts". Bahaha, I'm so sneaky. 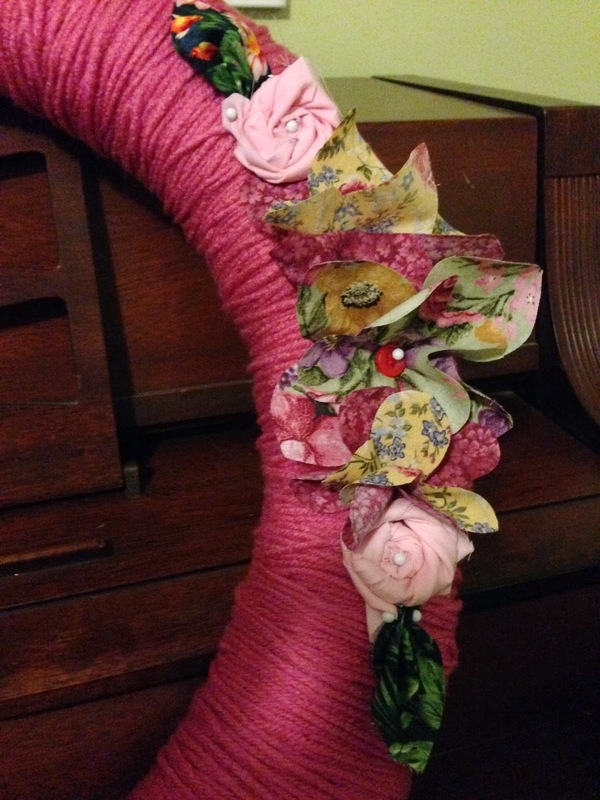 Anyway, I picked up a couple skeins of yarn in pink and purple, my wreath form, and some straight pins for pinning on all my fabric flowers. 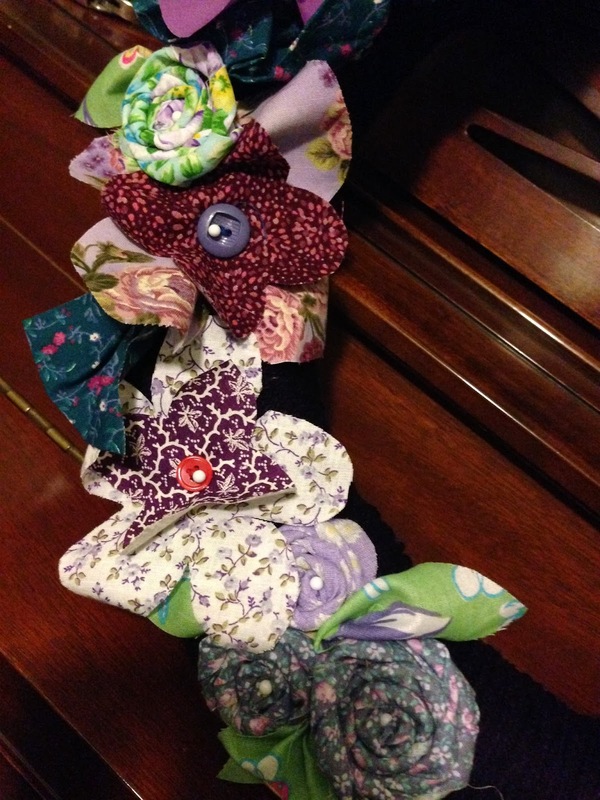 Then I went through all my scrap fabric and picked out coordinating fabrics in pinks and purples to use for my flowers. I was originally going to do the whole monogram thing, but in the end, I couldn't figure out how to attach the letter and there just didn't seem to be any good place to put it, so I left it out. I used a straw wreath form (make sure to leave the plastic on!) but you can use any type. I've also heard that a pool noodle duct taped into a circular form works great. 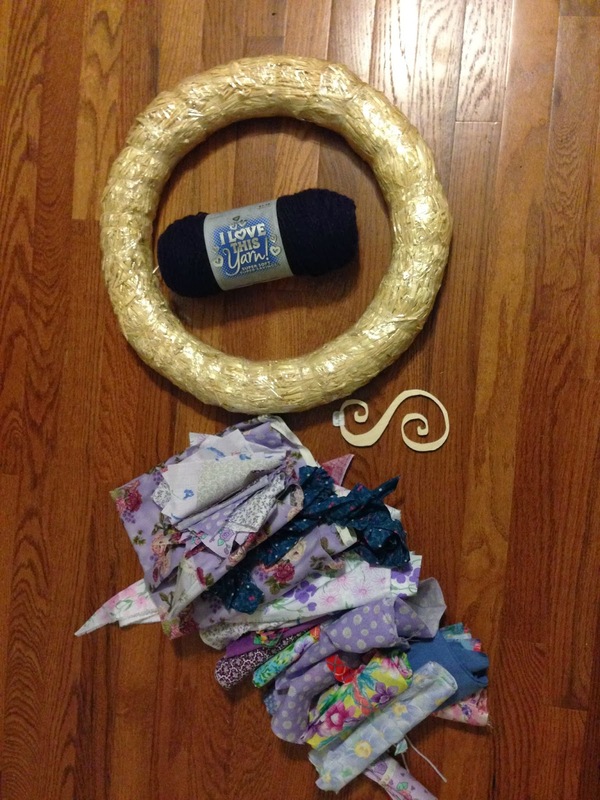 Anyway, just start wrapping your yarn around the wreath form... and around, and around... for about a solid hour and a half until it's completely covered. This took about 3/4 of the skein of yarn and did take almost a full 90 minutes to finish. 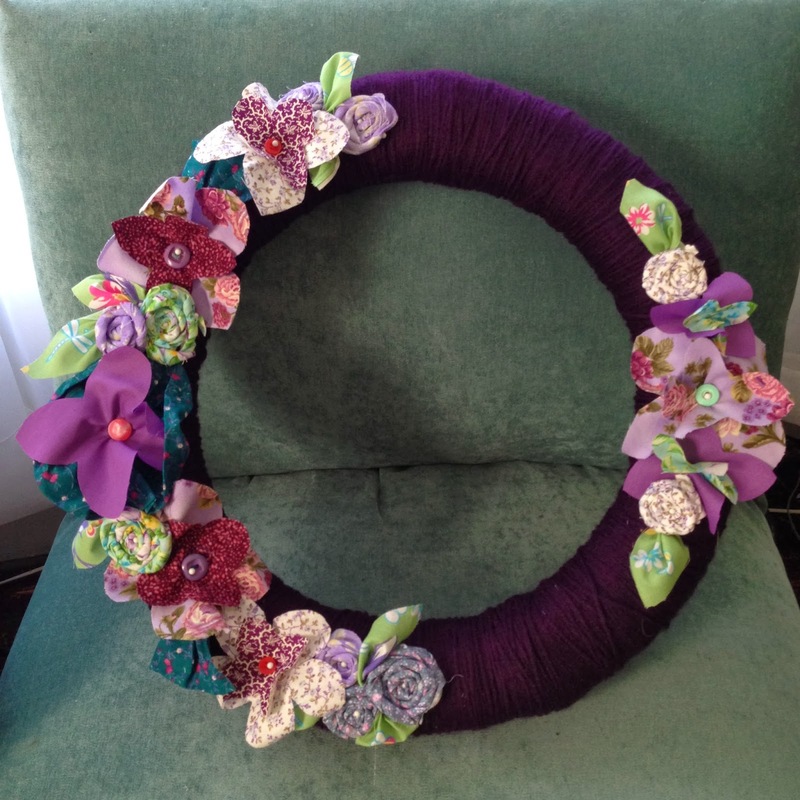 Once your wreath is wrapped you can start embellishing it as you want it. 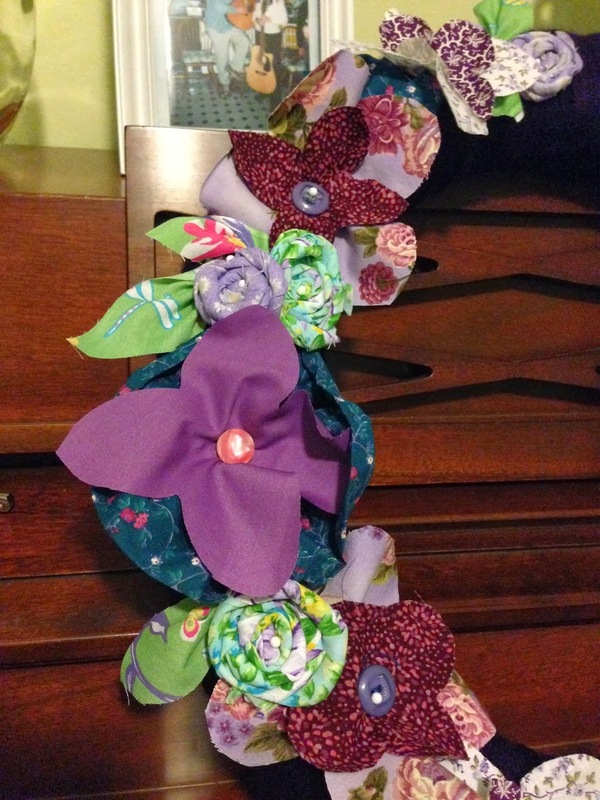 I cut out flower shapes in the scraps and layered them and then used buttons for the flower centers and straight pins to attach the flowers to the wreath. No sewing necessary. For the rosettes, I simply took long strips of fabric and then twisted it and rolled it into a circular pattern and pinned it on as well. I just kept adding until it looked full enough. For the leaves, I cut the fabric in a leaf shape, pinched the end together to make it more 3D and pinned them on. Surprisingly, this part went pretty fast... faster than wrapping the wreath. Once I had the first one finished, I simply copied the same pattern using different colored fabrics so they would both have basically the same design in the end. All in all, it was really pretty easy and fun. I might get ambitious and make more later on. There are some really adorable Halloween, Thanksgiving, Winter, and Christmas themed ones on Pinterest. 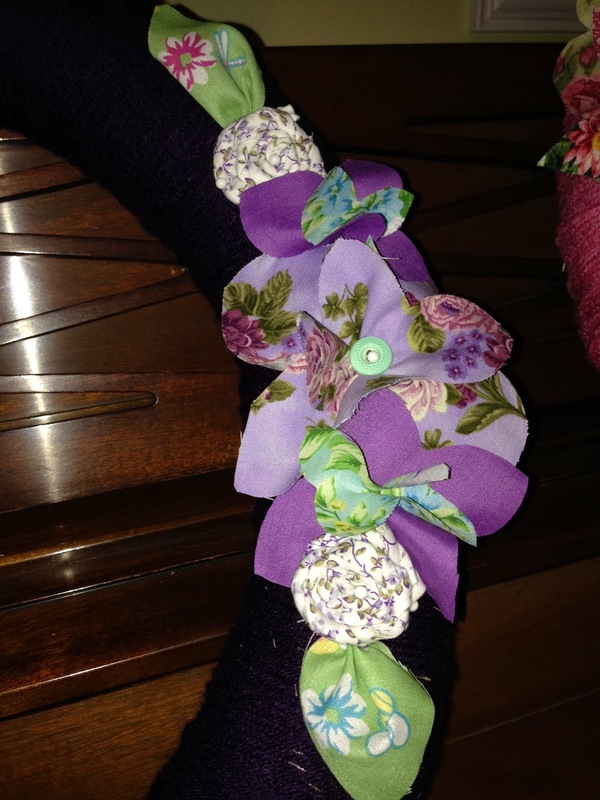 And if you have extra yarn or fabric lying around, it's a great way to use it up. This would work well with ribbon too, and probably go a lot faster. 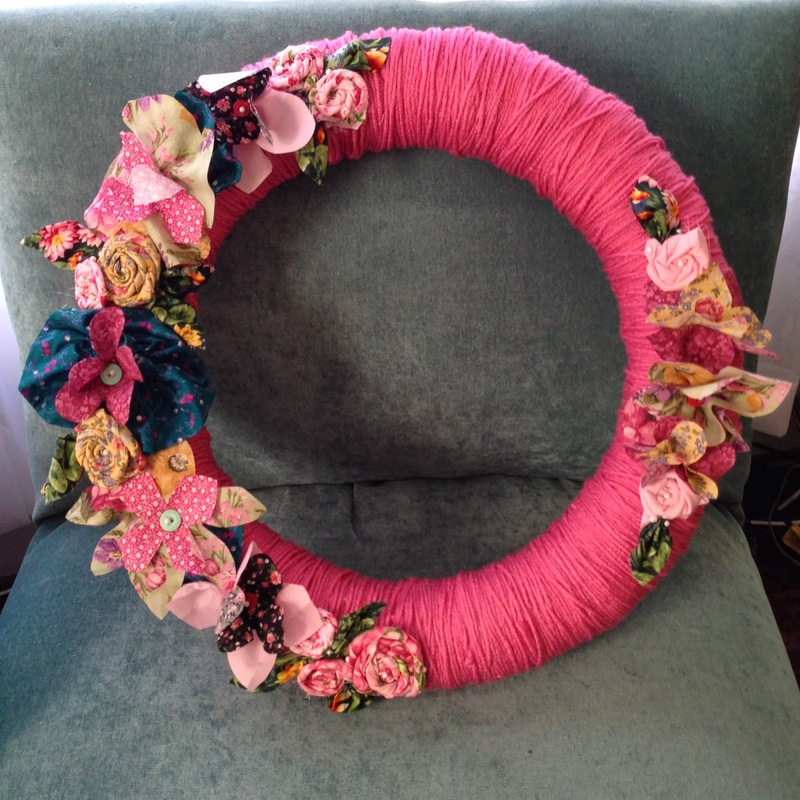 I'm thinking a cute feather boa wrapped around the wreath form might look adorable too... hmmm.... The possibilities really are endless!